Claude, an Oklahoma native, began performing professionally at the age of 10 with brother-in-law Ben Johnson. He was born February 22, 1908 and passed away April 25, 2004. 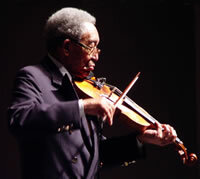 Williams learned to play string instruments to include the bass, violin and guitar with the assistance of his brother-in-law. Williams and Johnson performed for different event and venues to include barber shops, hotels and outdoor concerts throughout the Oklahoma territory. Originally a by-ear-player, he received formal music lessons while still performing across the region. He was a “Territory Band” musician and was traveling extensively when he was recruited by Nat “King” Cole to perform in Chicago, Illinois on the violin and bass. William “Count” Basie recruited Williams to play guitar with the Basie Orchestra. Williams felt the guitar was not his strong-suit and desired to play the fiddle again – his passion. Claude traveled with the Basie Orchestra for a short time and returned to Kansas City and performed with Andy Kirk’s Twelve Clouds of Joy. He played with such international notables as Jay McShann, Buddy Tate, Richie Cole, Al Gray, Harry “Sweets” Edison, Eddie “Lockjaw” Davis, Eddie Baker and Clark Terry, just to name a few. On June 04, 1972, Man from Muskogee was recorded on the Stackville label in Toronto, Canada and featured Claude (Fiddle, Electric Guitar and Vocals), Jay McShann (Piano), Paul Gunther (Drums), and Don Thompson (Bass). He was inducted into the Elder Statesmen of Kansas City Jazz in 1983 during the Kansas City Jazz Festival. The festival featured William “Count” Basie and the Basie Orchestra – celebrating his 79th and final birthday. Claude was a Gold Card member of the American Federation of Musicians 34-627. Williams also had long-running engagements at several local venues to include to Blue Room and Plaza III; nationally at the Chicago Jazz Festival, Newport Jazz Festival and Kansas City Blues and Jazz Festival; and internationally in Australia, Japan, Switzerland and Austria – at jazz and blues festivals. Claude married Blanche Fouse-Williams on November 01, 1991 and continued performing until his passing.